This corker was sent to me a couple months ago via anonymous tipster. I tabled sharing it until I felt the time was right. Today, for reasons which will soon become apparent, is that day. The above polemic was created shortly after the 2005 rezone. As it was explained to me (by said tipster) its purpose was to criticize GWAPP assuming the lion’s share of credit for the successful fight against the Trans Gas power plant which was slated to grace Bushwick Inlet. For those of you who were not here in 2005 (and I suspect there are many) I present the following video from NY1. 1. He was recently appointed* to the advisory board of the new “GWAPP”. 2. And I also recently verified that contrary to what is stated in this gent’s biography on the aforementioned site (an excerpt of which is above), Mr. Perlmutter is not now nor was he ever under the employ of Develop Don’t Destroy Brooklyn. What is not mentioned in this biography is every bit as fascinating— if not more so— than what is. 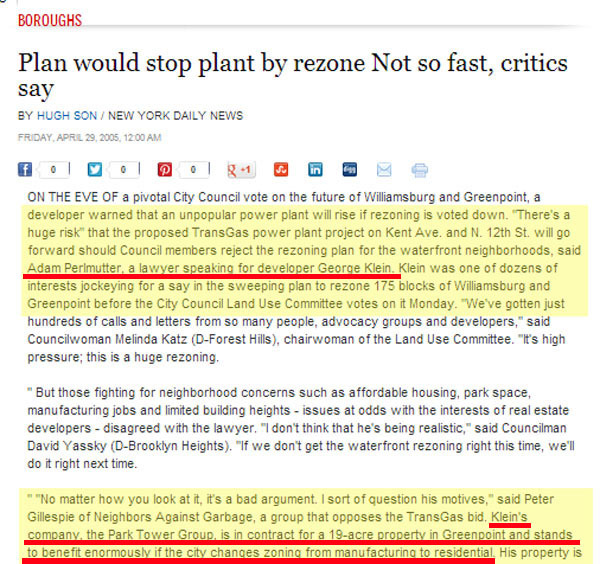 Namely, that in addition to being a “Community Activist” in the fight against the Trans Gas power plant, Mr. Perlmutter also happened to be under the hire of George Klein, the fellow responsible for Greenpoint Landing, so as to argue in favor of the 2005 rezone. But don’t take my word for it. It is stated quite clearly in the April 29, 2005 edition of the New York Daily News. 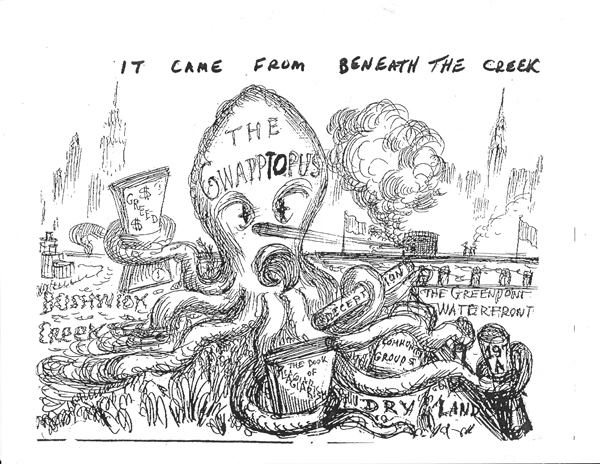 Straight up: as the featured cartoon attests, GWAPP has been the subject of controversy for some time. Controversy which persists to this very day. Controversy which would have, could have, should have been avoided by the simple practice of transparency. Greenpoint Landing, regrettably, is going to happen whether we want it or not. That’s reality. However, I do not think expecting an organization which purports to represent the interests of the community giving full disclosure of their activities and board/advisory panel’s business relationships— past and present— is asking too much. Or is it? Now if you don’t mind, gentle readers, I am off to corner the market on ear plugs. I sense a very lucrative entrepreneurial opportunity is at hand!